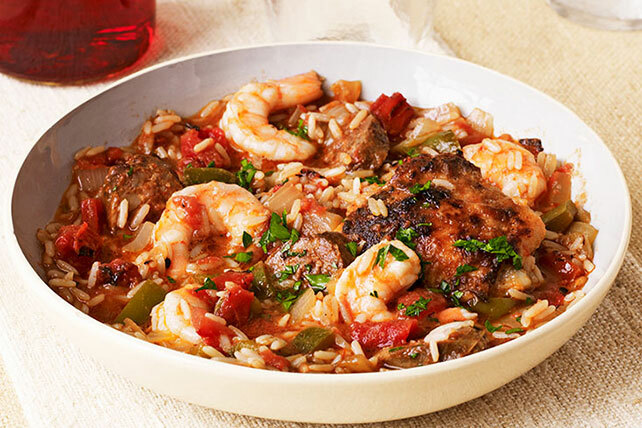 Our spicy New Orleans-inspired jambalaya is so loaded with flavour, you'll be amazed that it's such an easy recipe to prepare. Just 15 minutes of prep and no beads required. Combine flour and seasonings in shallow dish. Add chicken; turn to evenly coat both sides of each thigh. Heat oil in Dutch oven or large deep skillet on medium heat. Add 4 chicken thighs; cook 4 min. on each side or until each is golden brown on both sides. Transfer to plate, reserving drippings in pan. Repeat with remaining chicken. Add onions, green peppers and garlic to drippings in pan; cook and stir 5 min. Stir in tomatoes, barbecue sauce and sausage. Return chicken and any juices from plate to tomato mixture; simmer 25 min. or until chicken is done (165ºF), stirring occasionally. Meanwhile, bring broth to boil in medium saucepan. Stir in rice; cover. Simmer on medium-low heat 20 min. or until broth is absorbed and rice is tender. Add shrimp to tomato mixture; stir. Simmer 8 min. or until shrimp turn pink. Spoon rice into shallow bowls; top with chicken mixture. Sprinkle with parsley. Substitute 1 Tbsp. fresh thyme leaves for the parsley.